Was Bubba Bixby born big and mean, full of teeth and ready to bite? Or did he grow into being that way? 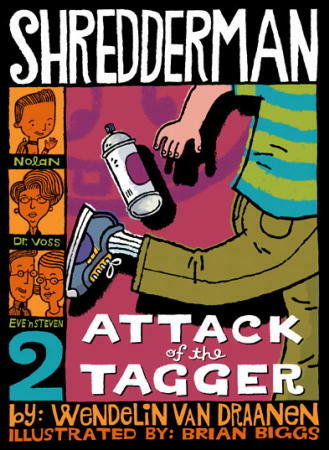 In this 4-book series, super-nerd Nolan Byrd comes to the rescue of his classmates (and himself) and in the process unveils the answer. Bullies beware! Shredderman is watching. 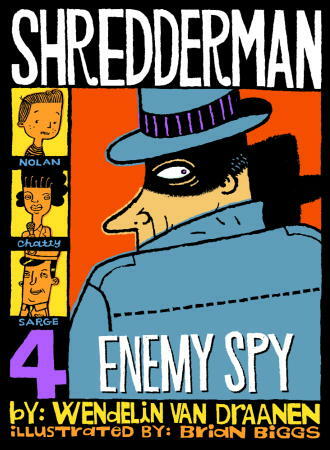 Click here for Free Teacher Support Materials for all Shredderman books. Someone's spraying graffiti and the police don't seem to be able to stop them. In the name of truth and justice, it's Shredderman to the rescue! A sneaky reporter, a television star, and a new sidekick--word is spreading across the nation about Shredderman. Will Nolan lose his secret identity? Nolan helps the police break up an international spy ring but Bubba is onto him. Is it curtains for Shredderman? The exciting conclusion to the series. Looking for more? 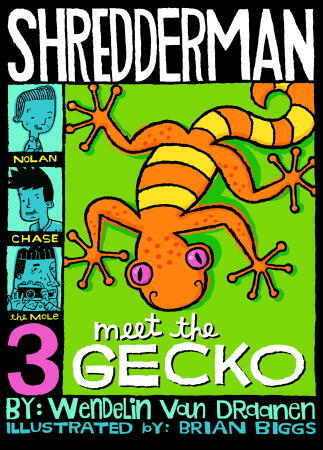 The Gecko & Sticky series stars the "real-life" characters from Nolan's favorite TV show. Readers will meet the deadly, diabolical Damien Black, the reluctant superhero Dave Sanchez, and his hilarious sidekick--the one and only kleptomaniacal (ahem, sticky-fingered) talking gecko lizard--Sticky. ​ these adventures make any reader want to reach for the superhero inside. Book #1 (Villain's Lair) Summary: Dave Sanchez discovers that the gecko hiding behind his bookcase can talk. And has a magic wristband. One that will allow him to walk on walls. Or gain super strength. Or go invisible. Or fly. Asombroso!​ All Dave needs is to retrieve some magic ingots hidden in the dungeon of the dastardly, diabolical Damien Black. Dangerous, but… what boy doesn’t want to fly? Dave is in trouble now. Big, big trouble. Book #2 (Greatest Power) Summary: On a quest to right a bank heist, Dave and Sticky are lured through the city’s sewer network and find themselves entering the underbelly of Damien Black’s monstrous mansion. Ay-ay-ay! Inside the mansion, they encounter the bumbling Bandito Brothers, the sinister Snake Alarm, and learn what’s behind a blood red door. They also come face to fur with Damien’s Java-Junkie Monkey, only to learn that he, too, is trouble. Big, big trouble. Book #3 (Sinister Substitute) Summary: Dave’s snarky science teacher goes missing. Excelente picante! However, Dave soon discovers that bemeath the substitute’s deceptive disguises beats a wicked heart. A heart that returns each night to a maniacal mansion where a certain science teacher is being held captive. The only way to give the sub the slip is to save the science teacher. Ay-ay-ay. Yes, Dave is in trouble again. Big, big trouble. Book #4 (The Power Potion) Summary: Sick of trying to reclaim the magic wristband, the dastardly, dangerous and decidedly devious Damien Black commissions a potion to give him super strength. Holy tacarole! We can’t have that! So Dave and Sticky go to intercept the delivery, only to find themselves going up against tree-climbing goats, terrifying tarantulas, and one hyped-up Java-Junkie Monkey. Yes, our heroes are in trouble again. Big, big trouble.